Stormwater management is the practice of controlling and reducing stormwater runoff from a property. When land is developed, impervious surfaces, (such as roads, parking lots, and buildings) create additional stormwater runoff from a site. Typical developments route this 'excess' water into storm drains and pipe them to a stream or detention basin. More volume of waters runs off these impervious surfaces and at a higher rate than natural areas. When water is discharged to a stream at a higher quantity and higher rate, stream habitats degrade, the banks erode, and flooding increases. Additionally, runoff often carries pollutants, such as bacteria, nutrients, and others. The key to successful stormwater management is to SLOW IT DOWN, SOAK IT IN! Infiltrating stormwater onsite helps recharge groundwater flows, decrease erosion, reduce flooding, and minimize pollutants. We fund Stormwater management projects, such as detention basin retrofits, wetland creation/restoration, or other Green Infrastructure projects that help to slow down and filter stormwater runoff before it flow into local streams. A "retrofit" is the modification of a stormwater management system to improve its performance, typically for water quality (pollution) or water quantity (flooding/erosion) improvement. The Banklick Watershed Council has conducted pilot projects to modify existing stormwater detention basins to retain more water and reduce erosive flow velocities. 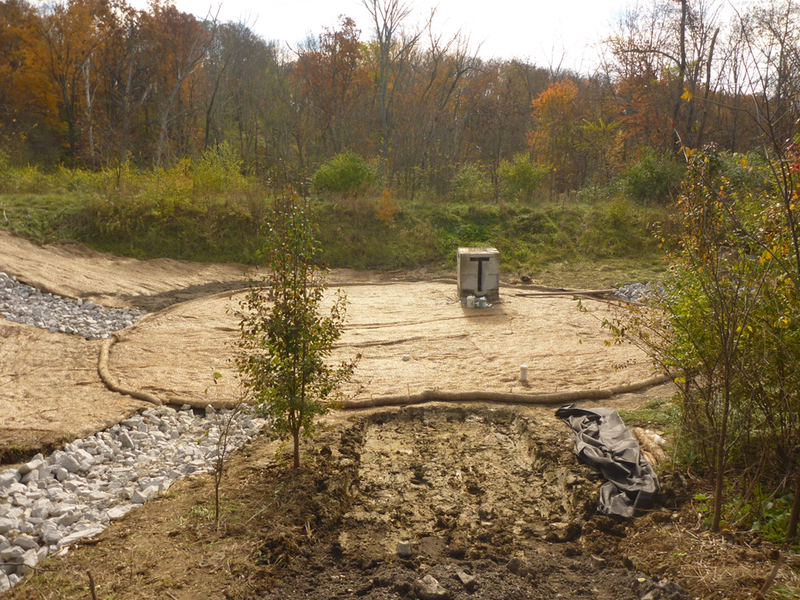 During construction of a full basin retrofit with grading and native plants.